Vladimir Tarasenko, Mikael Granlund, Teemu Pulkkinen and Tom Kuhnhackel are among the leading players in Central Scouting's ranking of the top European prospects. Granlund starred for Finland at the 2009 World Junior Championship and the World Under-18 Championship. Now the 5-foot-10, 180-pound forward is playing for HIFK Helsinki in the Finnish Elite League. In 17 games, he has 13 assists and 18 points, and he's the top-rated Finnish-born skater. NHL Director of European Scouting Goran Stubb called Granlund a "Saku Koivu clone," and added, "He's small, but no one's told him he's small. He has a really good, winning attitude, works very hard. He's tough, and he has very good hockey sense." Pulkkinen, a 5-11, 183-pound right wing, has played just 12 games with Jokerit, due to a wrist injury that will keep him out until December and puts his participation in the 2010 World Junior Championship at risk. He's second to Granlund among Finland skaters. "Pulkkinen has all the talent, an excellent shot, but he has to grow up a little bit," said Stubb. "He's that kind of a guy. When they change lines he's the last guy to leave the ice. He has to think more of the team instead of himself, but he definitely has talent." Tarasenko, a 5-11, 202-pound right wing, has 5 goals and 11 points in 20 games with Novosibirsk in the Kontinental Hockey League. 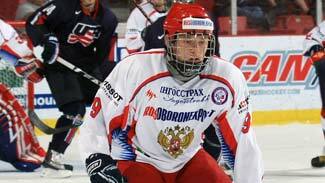 Tarasenko is the top-rated prospect in Russia. "He's a classical Russian winger," said Stubb. "Vladimir is very effective around the net with his excellent overall skill level and vision. He is a strong, mobile skater with a quick shot. He is not only a sniper but also a good passer and playmaker." Kuhnhackl, a 6-2, 172-pound right wing, is the top-rated German skater. He had 11 goals and 21 points in 42 games with EV Landshut's second-division team last season, and had a goal and an assist in six games for Germany at the World Under-18s. This season he has 8 points in 16 games with Landshut. Other touted European skaters include Bohumil Jank, a defenseman with Ceske Budejovice junior team and the top-rated skater from the Czech Republic; Novokuznetsk left wing Maxim Kitsyn, the second-ranked Russian skater; Chelyabinsk center Evgeny Kuznetsov, No. 3 in Russia; and Ludvig Rensfeldt, a left wing with Brynas' junior team in Sweden. The job of NHL Central Scouting is to provide a road map to guide the League's 30 clubs as they analyze the top prospects available for the Entry Draft. The latest milepost was passed Tuesday, as Central Scouting released its preliminary rankings for the top levels of North American junior hockey. Central Scouting ranked the top 25 skaters and top six goaltenders for the Ontario Hockey League, Quebec Major Junior Hockey League, Western Hockey League and United States Hockey League, which now includes the United States national Team Developmental Program. Plymouth Whalers center Tyler Seguin surprisingly took the top spot in the OHL, ahead of the much-hyped Taylor Hall. Seguin's outstanding play started during the summer at the Memorial of Ivan Hlinka Tournament, when he had team-highs of 7 assists and 10 points in four games, and it has carried right into the OHL season. Seguin is second in the league with 19 goals and fourth with 36 points, all in just 18 games. "Tyler Seguin has had a great start to the season," Central Scouting's Chris Edwards told NHL.com. "He has been producing and playing consistently well. He makes things happen every time he is on the ice and he makes his teammates better." Hall, last season's Memorial Cup MVP for the Windsor Spitfires, has scorched his way up the OHL leaderboard. He has league-highs of 21 goals and 45 points, and in his last 12 games, he has 11 goals and 21 points. "Hall is a proven player, he won the Memorial Cup MVP last year and for good reason," Edwards said. "Both of these players (Seguin and Hall) will be very good pros." Hall's Windsor teammate, defenseman Cam Fowler, is No. 3, followed by Kingston Frontenacs defenseman Erik Gudbranson and the Alexander Burmistrov of the Barrie Colts. Niagara Ice Dogs goalie Mark Visentin is the top-rated goaltender in the OHL. He has just seven wins and a 3.61 goals-against average, but he's out-played Petteri Simila, a Montreal Canadiens 2009 draft pick, for the No. 1 job. "He's got good size, moves very well, got great quickness," Central Scouting's Al Jensen told NHL.com. "He's just very determined, got great butterfly, great net coverage. … His push-offs are very strong and very quick. He's square to the puck, his glove hand is good. Huge improvement form the previous year. His confidence level is real high. He's got great size. He plays big in the net; very, very quick feet and pads. Very technically sound, as well." The Belleville Bulls' Phillipp Grubauer is No. 2 among goalies, followed by Michael Houser of the London Knights. Leading the way for the QMJHL are a pair of Moncton Wildcats teammates, defenseman Brandon Gormley and forward Kirill Kabanov. Gormley has 5 goals and 16 points in 22 games, and has been a key component to a Moncton defense that's allowed a league-low 58 goals. "He (Gormley) is what a lot of teams are going for," Central Scouting's Chris Bordeleau told NHL.com. "He's a good defenseman who can score and handle the puck, smart. … Gormley has got the whole package." Kabanov earned his high standing despite playing just 11 games due to a legal dispute between Moncton and his Russian league team. Once that got settled, however, Kabanov quickly has shown why the Wildcats fought so hard to get him to North America. He has 5 goals and 14 points, and he's tied for the team lead with 2 game-winning goals. Rimouski Oceanic teammates right wing Petr Straka and left wing Jakub Culek are ranked Nos. 3 and 4, followed by Shawinigan Cataractes left wing Michael Bournival. Another Moncton player, Louis Domingue, is the top-rated goaltender from the league. Domingue is just 8-7, but has a 2.50 GAA. "He moves very well, technically he's very quick," Jensen told NHL.com. "He's big, big in the net, handles the puck well, quick feet and pads." Mathieu Corbeil-Theriault of the Halifax Mooseheads is No. 2, followed by the Gatineau Olympiques' Maxime Clermont. Brett Connolly, last season's WHL and Canadian Hockey League rookie of the year, holds down the top spot among WHL skaters this season. The left wing from the Prince George Cougars has been slowed by injuries, but he has 4 goals in the seven games he's played; and when he does return, he'll likely remain among the top prospects for the June draft. "He puts the puck in the net, he's got good size, great on-ice awareness," NHL Central Scouting's Peter Sullivan told NHL.com. "He's not a crasher or a banger, but he finishes his checks. He does everything well." Following Connolly is Edmonton Oil Kings defenseman Mark Pysyk. In 18 games, the 6-1, 179-pounder has 3 goals and 14 points. The new-found offensive dimension in his second WHL season -- he had 20 points in 61 games last season -- is a product of his adjustment to the league and his maturing game. "He's an excellent defenseman, strong all-round game," said Sullivan. "He's solid in his own end, he joins the rush. He breaks up plays in the neutral zone, plays a ton of ice time. He's just an all-round solid defenseman. He just jumps out at you." Rounding out the WHL top five are Red Deer Rebels defenseman Alexander Petrovic; Medicine Hat Tigers center Emerson Etem; and Portland Winter Hawks defenseman Troy Rutkowski. The American college hockey season is just getting underway, but there already have been a few standouts. NHL Central Scouting's list of players to watch includes Notre Dame freshman center Riley Sheahen. Rated an 'A' player by Central Scouting, the 6-foot-1, 202-pound center has 2 goals and 7 points in 11 games. Last season, playing with the St. Catharines Falcons of the Ontario Hockey Association's Golden Horseshoe League, he had 27 goals and 73 points. Harvard freshman defenseman Danny Biega also is an 'A' player. The 6-foot, 191-pounder is scoreless in five games, but he comes with a strong pedigree. 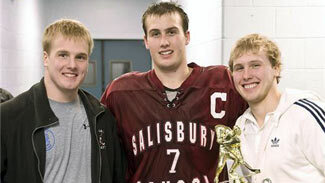 He's the youngest of three Biega brothers on the team, and last season he captained Salisbury School to a New England prep title. "Danny, so far as we can see, is just beyond his years in his poise and composure out there," Harvard coach Ted Donato told the Harvard Crimson. Minnesota State freshman center Tyler Pitlick is also an 'A' player. The 6-1, 194-pound center has 2 goals -- both on the power play -- and 5 points in nine games. The nephew of former NHL defenseman Lance Pitlick, Tyler had 31 goals and 64 points in 25 games at Centennial High School (Circle Pines, Minn.), and a was finalist for the state's Mr. Hockey Award. Seattle Thunderbirds goaltender Calvin Pickard is the WHL's top-rated goalie. He's just 4-8-4 this season, but Seattle is last in the Western Division. Despite that, he's 12th in the league with a 2.93 GAA and third with a .920 save percentage. He turned in a 57-save shutout in a 1-0 win against Tri-City. "He's not really a huge goalie (6-foot, 200 pounds), but he plays big," Jensen told NHL.com. "His positional play is excellent. He reads the play very (well). His net coverage is exceptional. He's smart, he's strong, got those good goalie instincts." Kent Simpson of the Everett Silvertips is ranked second, followed by Cam Lanigan of the Edmonton Oil Kings. Derek Forbort, a defenseman with U.S. National Team Development Program's Under-18 team -- which for the first time this season is playing in the USHL -- is the top-rated U.S. junior skater. The tall (6-4-1/2) defenseman has 8 assists and 12 penalty minutes in 18 games against a mix of college and USHL competition. "Derek Forbort has good top-end ability at both ends," Central Scouting's Jack Barzee told NHL.com. "He's smart and skates so well, he's almost 6-5 and he's got everything there in front of him. It's just a matter of filling out and getting more experience and playing. He's probably a top-two defenseman in the NHL if he reaches his potential." USNTDP defensemen take four of the top five USHL spots. After Forbort, Stephen Johns is ranked No. 3, Justin Faulk is No. 4, and Jarred Tinordi is No. 5. Tinordi is the son of former NHL player Mark Tinordi. The top-rated non-USNTDP skater is Tri-City's Jaden Schwartz, ranked No. 2. The 5-10, 180-pound center is tied for third in the USHL with 20 points in 14 games. "Schwartz is an incredible player who makes all kinds of things happen around him," said Barzee. "He's playing on a team that isn't as gifted as he is, so some nights people will say he didn't get any points or he didn't do this or that. But he does so many other great little things, like getting the puck toward the goal and getting himself loose. He can strip people of the puck … just at both ends of the ice he's a complete player." In goal, the USNTDP's Jack Campbell is the top choice. In 10 games, he is 5-4-1 with a 2.18 goals-against average and .921 save percentage, and he helped the U.S. win gold at the Under-18 Four Nations Cup earlier this month. His outstanding play at last spring's World Under-18 Championship also still resonates. There, he backstopped the U.S. to the gold and was named to the tournament's all-star team. "He's got good size, doesn't beat himself, his positioning is very good, great butterfly style -- a blocking-style goalie," Jensen said. "Good quickness in recovery, but he's not all over the place. He'll make the saves." The Lincoln Stars' Jared Coreau is ranked second, with the Sioux City Musketeers' Willie Yanakeff at No. 3.